Patented No Taper Technology® creates even grip pressure for a more consistent putting stroke. Parallel design has uniform lower hand profile to minimise grip pressure and maintain putter head path for a more consistent stroke. 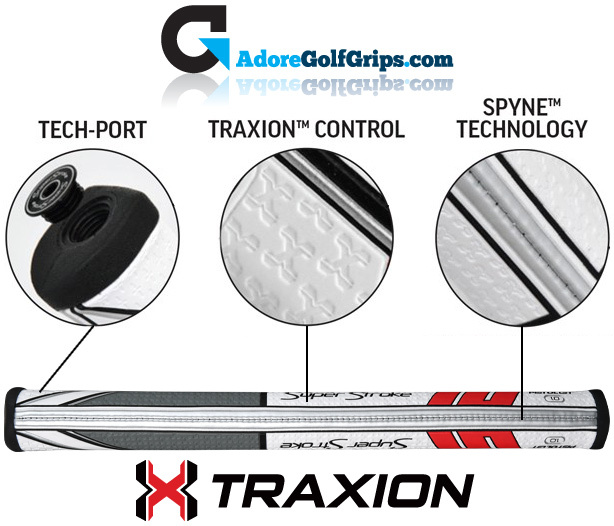 Building on the superior feel and playability of the original SuperStroke putter grip, the new Traxion™ offers an advanced surface texture design for enhanced feedback. The strategically designed Traxion™ zones on the tacky polyurethane outer layer offer an amazing comfortable feel leading to greater overall confidence. Advanced Spyne™ Technology is specifically engineered to aid in repeatable hand positioning. Repeatable hand placement leads to greater consistency in squaring the putter face at time of impact during the putting stroke. Designed to accept all SuperStroke “Tech-Port” accessories including the CounterCore weight system to engage the larger muscles for a more stable and repeatable putting stroke. Utilising such muscles helps to reduce putter face angle rotation caused by wrist manipulation while improving putting stroke path for greater consistency. Please note that the 25g, 50g and 75g CounterCore Weight is sold separately. SuperStroke’s 25g, 50g and 75g CounterCore Weight is made to fit the new TRAXION range of putter grips. The CounterCore weight can be easily fitted within the threaded end cap of the putter grip - the choice is yours. Within the SuperStroke TRAXION Flatso range of putter grips, there is a 1.0, 2.0 and 3.0 profile. Each profile has a range of colours - there really is a putter grip for every golfer. The SuperStroke TRAXION Flatso range has a 10.50” grip length.